Hello, I'm Jake, a retired production planner. I've been talking to my coffee mate Ben about the factory where I have spent the better part of my life. Believe me, I have seen things go well and even more go very wrong. I’m outside the gate now, but the grapevine is keeping me up to date. Which is why I know that the factory is heading into oblivion, as management does not seem to understand commonsense principles and they are testing the patience of their main customer. But wait, things look like they might change when new management is brought in. This new plant manager might change things around, and thanks to my old friends we can keep on top of things. Do you want to hear my story? The concepts imbedded in the factory's journey capture the leading practices in progressive and proactive management. The commonsense concepts embody the philosophy of collaboration, shared fate, mutual respect, and leveraging the intellectual capital that exists in each and every factory. This book is for you if you want your factory to survive and thrive! Dr. Kenneth N. McKay is professor of production management and information systems in the Department of Management Sciences, Faculty of Engineering, University of Waterloo, Ontario, Canada. Since the mid 1980’s, he has been researching production control concepts, building scheduling systems, and consulting in the manufacturing sector. The focus of his work has been on commonsense manufacturing and the integration of human judgment with information technology in rapidly changing situations. 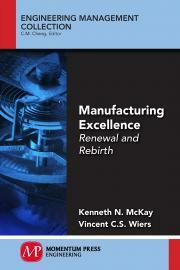 He has also extensively researched the history of manufacturing management. Dr. Vincent C.S. Wiers has more than 20 years of experience in the area of production planning and control. He is employed by the Eindhoven University of Technology as an Industrial Fellow. His research interest is the human factor in production control. As a consultant, he has been working on more than 30 projects to improve supply chain planning. He is a recognized specialist in advanced planning & scheduling and he has worked with leading software suppliers in implementation projects.